The A-Team is a group of outspoken PBwiki experts who test out all of our newest features and let us know what they think. This year we’re looking for a few more people to join the team. This is a great chance for you to look under the hood at what we’re developing at PBwiki and affect the way it works. This offer is not for the meek or faint of heart! You’ll be swimming in uncharted waters, trying out brand new features as we develop them. Things might change drastically, or maybe there will be bugs. We count on our Alpha Testers being there to help us find problems that we don’t see here, on our own computers. If you’re an experienced PBwiki user who wants to test out the latest features and tell us what you think, sign up for the PBwiki Alpha Team. Some folks are experiencing read-only access and aren’t able to edit their wiki pages. Our engineers are aware of the problem and working on it. Your wiki and all of your data is once again accessible – both to view and edit. We tracked down and fixed a problem that was causing an infinite loop in our servers. We’re sorry to have experienced slight downtime during your work day. 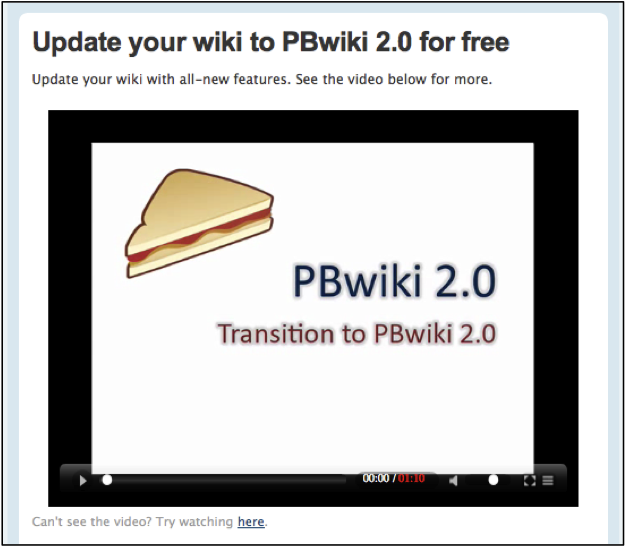 If you’re still on a PBwiki 1.0 wiki, you’ve probably received an email recently about updating to PBwiki 2.0. Beginning on March 9th, 2009, all 1.0 wikis will automatically update to 2.0. Don’t worry — you have plenty of time to make the change (a free update, which takes less than 5 minutes), plus we’ve got an excellent support team waiting to help you. When we launched PBwiki in 2005, we designed our system to be easy to edit and share. Now, 4 years later, our users have taught us a lot. You’ve told us that you want more control over users, more powerful editing/sharing features, and an improved user interface. In 2008, we rolled out PBwiki 2.0 to address those needs. A year later, we’ve concluded that for just about every usage, PBwiki 2.0 works better than 1.0 for collaborating and sharing information. 2.0 even gives you new features like Classroom Accounts (which allow educators to invite students without email addresses) and Document Management. I have used PBwiki for 2 graduate courses with the same students. All of us like the PBwiki 2.0 over the earlier version. This version feels more intuitive and allows me to break the class into groups with their own work areas (folders). -Jane Allgood, Ph.D.
You can use a simple wizard to update to 2.0 (again, it’s free and takes about 5 minutes). You will not lose any content by updating to 2.0, and with Classroom Accounts (which replace invite keys), reader comments, folders, easier editing, full CSS customization, and so on, PBwiki 2.0 allows you to do just pretty much everything you could with PBwiki 1.0 and more. You can update to 2.0 at any time, or you can wait until March 9th, and we’ll update for you. To update to PBwiki 2.0, go to WIKINAME.pbworks.com/migration.php (just replace WIKINAME with the name of your wiki) and follow the instructions on screen! Today we’re excited to announce an even easier way to customize your PBwiki pages. In the past if you wanted to remove static elements from the page – like the comment box or the sidebar – you had to use custom CSS. This was a pain for many reasons – you had to know CSS, even then your CSS code might not work in all browsers and it was hard to create default settings for your page. Display your comments in reverse chronological order or remove the comment box entirely. Remove header, footer and contact forms from your wiki. Chose what elements are available on the side panel – remove the sidebar, folders and recent wiki activity. Note: If you remove the comment box, existing comments will be saved but not visible on the page. 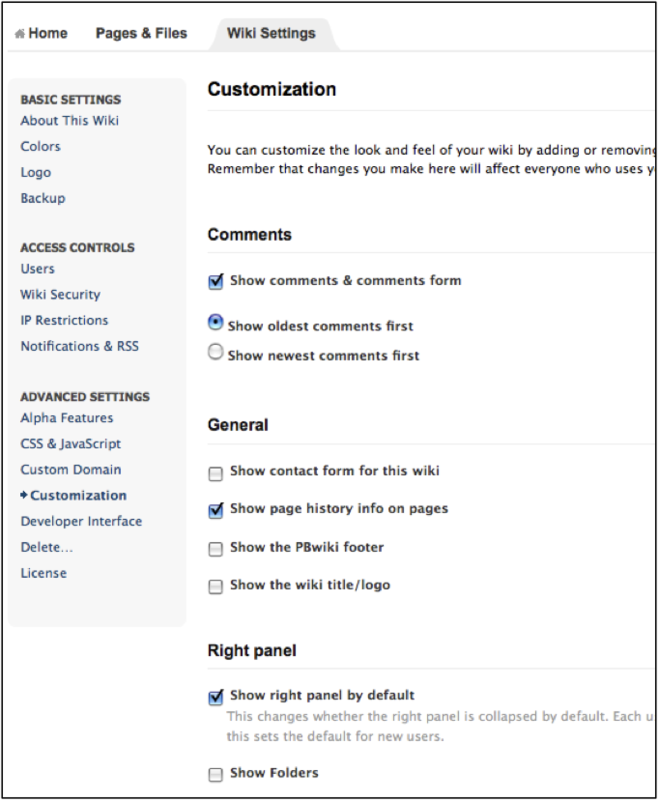 To add custom settings to your wiki, go to Settings —> Advanced Settings —> Customization. This feature is available on all premium wikis. We love feedback! Let us know how you will customize your wiki! We want to say thanks for spreading the word! For you thousands of presenters, we’ve developed materials that make your job easier – the PBwiki Presenter Pack. This is a free virtual presentation guide that include videos, how-to guides, a free tee-shirt AND three free premium wikis! Who can apply for a PBwiki Presenter Pack? This program is designed specifically for educators, instructional technologists, and folks in the non-profit field. Already over 2,000 people have applied for and received their free wikis. If you’re presenting at an upcoming conference, or just showing a group of co-workers how to use a wiki, you can apply for the PBwiki presenter pack. Apply for your presenter pack today!